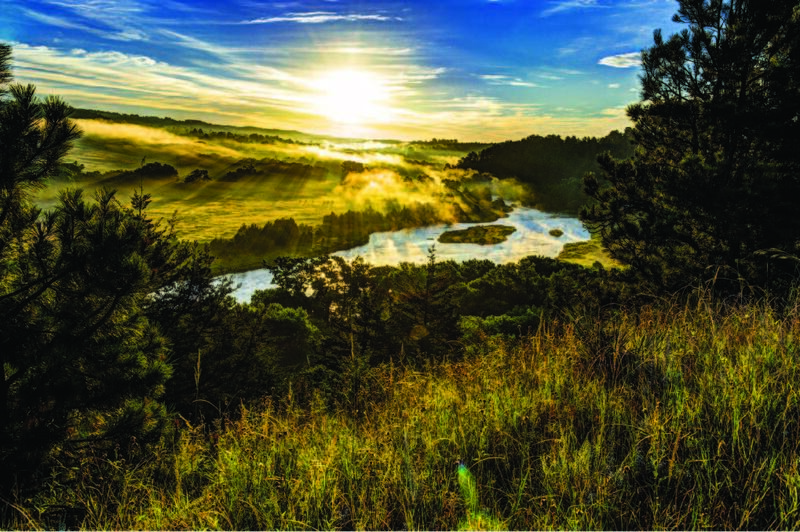 A spectacular forested property along the Niobrara River, the Chat Canyon Wildlife Management Area, was acquired in 2013 and forever protected from subdivision and development. This acquisition was the culmination of a 12-year effort on the part of the Nebraska Forest Service to implement the Forest Legacy Program, and involved numerous NFS staff and two state foresters. But the NFS played only a part in this effort. This acquisition simply never would have happened without the partnership support and tenacious and highly competent contributions of many people from the University of Nebraska, U.S. Forest Service (USFS Forest Legacy Program), Nebraska Game and Parks Commission (NG&PC), Nebraska Environmental Trust (NET), The Conservation Fund, National Wild Turkey Federation (NWTF), and two landowners who were passionately committed to conservation. Funding was provided by the USFS, NG&PC, NET and NWTF. The years of hard work of many highly skilled people who helped to secure this property paid off despite the many ups and downs and near-death experiences in the process, two aborted acquisitions, multiple grant extensions, despairingly short funding deadlines, and the daunting complexities of managing an acquisition involving six organizations. Some 30 miles west of Valentine, this beautiful, diverse and ecologically significant 400+ acre property is bisected by the Niobrara River. It is now owned and operated by the Nebraska Game and Parks Commission, and adds to their statewide network of Wildlife Management Areas. Uniquely, it will be co-managed for both forestry and wildlife objectives under a formal agreement between the Game and Parks Commission and the Nebraska Forest Service. Chat Canyon WMA is a significant, important, and permanent addition to Nebraska’s protected wild lands, and will serve as a powerful demonstration to other landowners of how forestry and wildlife management objectives can be combined on the ground in the Niobrara forest ecosystem. Chat Canyon is the home of unusually high numbers of nesting Yellow Breasted Chats, a beautiful songbird that is increasingly uncommon elsewhere and which has disappeared in eastern Nebraska.